I'm still getting settled in here in Virginia Beach. We're about 10-20 minutes from the ocean, but if ever there was a place where the Interstate isn't scenic, it's here. All you see is road and nothing to the sides. Of course, the number one thing about which you'll hear me bitching is the eastern time zone. I just saw the Monday Night Football kickoff. At 9pm. For me, that's not cool. In Hawaii, the cool thing about football on Sunday was that it was all over by about 6pm (though getting up for 7am early games sucked). Here, you'd get to sleep in Sunday morning, but if your team is playing on Sunday or Monday night, you're screwed. Cue me up for "screwed" when the Eagles face the Seahawks later this season. So, I don't have really anything to coherent to post about, though I was the only guy in the area rooting for the Seahawks on Sunday (too many 'Skins loyalists here). My next meaningful post will be some time in the next couple days, dealing with the Canucks and the opening of their season as well as the rest of the league, with every team playing on Wednesday night. But the most bunk thing about the Outdoor Life Network television deal is that the two nights of the week they televise hockey will be Monday and Tuesday night. I guess Monday is good because they avoid a bunch of NBA conflicts, and those two days won't run into the NCAA tournament in March (it'll run into the title game in April though). But the real reason I made this post was to answer a question for myself. 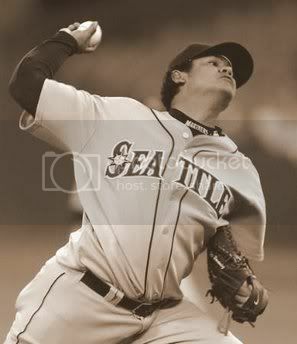 Using Picasa, does Felix Hernandez still look awesome in sepia tones? Of course he does. He's Felix. More to come from me, y'all. Enjoy yourselves.